Karkhana’s lineup features artists from Beirut, Cairo and Istanbul whose individual projects echo a shared interest in sonic exploration. Karkhana’s lineup features artists from Beirut, Cairo and Istanbul whose individual projects echo a shared interest in sonic exploration. Guided by free jazz, tarab and psychedelic rock, the band ventures out from traditional Middle Eastern structures to meet in highly improvised dialogue. Using regionally rooted vocabulary and diverse instrumentation, Karkhana crafts a new musical language with vibrant chatter, dizzying swells and whimsical jeers. 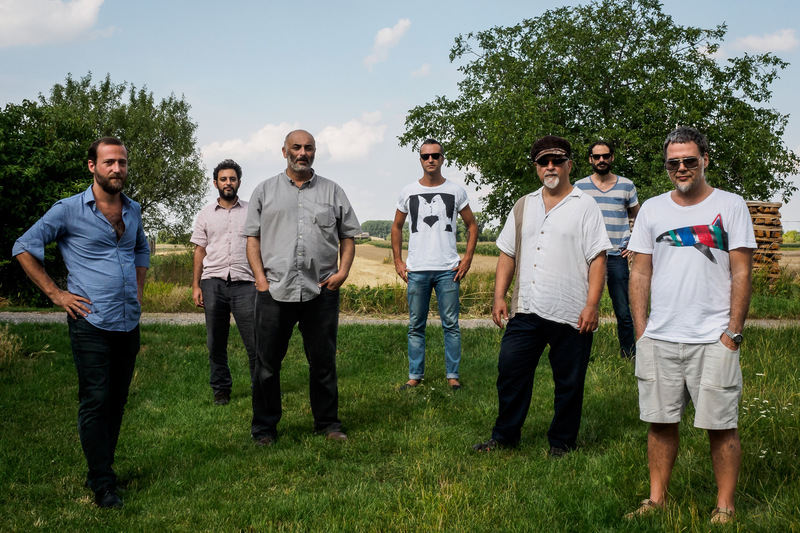 The group has released two full-length albums since meeting in 2014 in Beirut: Nafas (Omlott, 2016) and Live at Metro Al Madina (Sagittarius A-Star, 2014). Karkhana consists of Umut Çağlar (double reeds, bamboo flutes, percussion, violin), Tony Elieh (electric bass, effects), Mazen Kerbaj (trumpet, objects, percussion), Maurice Louca (electric organ, synthesizers, effects), Sharif Sehnaoui (electric guitar), Sam Shalabi (oud, electric guitar) and Michael Zerang (drums, cymbals, percussion).